I have always been an enthusiast of UFOs, Government Conspiracy and Black Projects. I was actually a paranormal investigator in Ohio for many years, landing hundreds of hours conducting research and doing field studies. Despite all of the bizarre cases I was involved with, I could never compare my interest level in them, with my interest level and intrigue I have for the Area 51 conspiracy. Something exciting is happening in the remote Nevada desert and after many years dreaming about visiting the area, I finally made it there. My wife and I set out from our Las Vegas resort on a beautiful but hot, Friday morning. We loaded up our convertible Mustang GT and set off for the road. I must say that our trip up through route 93 towards Alamo was very enjoyable. It was the first time we had been to the western United States or a desert climate, so the scenery alone was breathtaking. We went on a day in which Red Flag exercises were being conducted from NAFB. So, I was also quite busy watching the skies during our drive. However, being able to drive speeds of 110 MPH and above on Route 93 (please don't try this at home) took precedence in our entertainment agenda! Our first stop along this trip was in Alamo. I have always heard from DLR members that a fuel-up in Alamo was essential, as stretches between gas stations were as far as 110 miles. While pumping gas at the Chevron station in Alamo, we had a small encounter that turned out to be the most memorable of our trip and also provided some comedy relief. After pumping gas and putting the top up on the convertible, I started to walk towards the Chevron station entrance to pay for the fuel. Looking over to my right, I noticed a White Jeep Cherokee sitting at one of the pumps. Looking down at the license plates, I saw that the vehicle was indeed Government owned. I knew that the white Jeep Cherokee was commonly used by the Area 51 security force (Cammo-Dudes), but I wasn't sure what they would be doing in Alamo. There was no driver in the vehicle and nobody pumping gas, so I assumed that if indeed a cammo was driving this Cherokee, he must be inside the Chevron station. Turning my path back towards my car, I went back and told my wife what I had seen. I gave her my Sony DSC-f707 camera and told her to point the camera towards the front doors of the building. If she was to see anyone wearing camouflage fatigues come out and walk towards the Cherokee, she was to pop off as many photos as possible of the person. So I left my wife to the surveillance duties and headed into the store. Walking in, standing right at the front counter was a sight I thought I might have never seen before. Standing there was an older man of at least 55 years of age, wearing gray cammo pants, a black ball cap and a belt with a large walkie-talkie amongst other gadget pouches. The man wore dark sunglasses and didn't speak to anyone. To make a long story short, the guy in cammo paid for his items and exited the store. I quickly paid for my gas immediately after and never took my eye off the "dude" as he went outside. Sure enough! The "dude" dressed in cammo was heading straight for the white Jeep Cherokee with Big Brother License plates on it! Exiting just seconds after him, I looked over and saw that my wife was snapping photos of the "dude" just before he got into his vehicle. I rushed over to the Mustang and hopped in. Slowly I pulled around the corner of the gas station and noticed that the dude whizzed right by the white Jeep Cherokee! 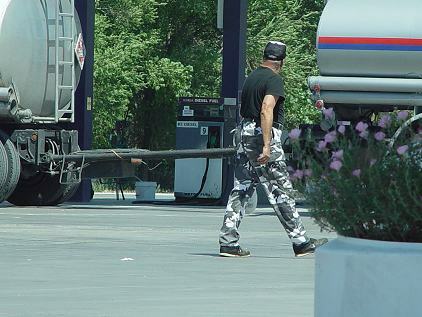 This so-called cammo-dude went across the road and hoped into a big 18 wheeler tractor-trailer. My cammo-dude experience went from awesome to total disappointment in about 3 minutes flat! Quickly our disappointment turned to laughter as my wife started making fun of me and the whole situation. Heading up 93 towards the 375 intersection, we stopped and got pictures of the "Alien Fresh Jerky" sign and then stopped at the famed Extraterrestrial Highway Sign. We stopped there and took pictures of us by the sign and took notice of three Area 51 workers cars parked under the shade trees. For the record, there was a red Toyota truck, a tan Mazda and a gray Ford Taurus. 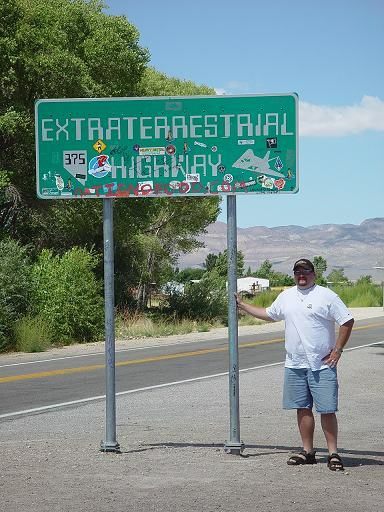 We then headed onto the ET Highway towards Groom Lake Road. Coming down from Hancock Summit on 375, Groom Lake Road wasn't hard to find. It is the only noticeable road that leads of into eternity. It appears as an infinite path into the Groom mountain range. We decided to turn left onto GLR and head right to the border. Passing what seem like a zillion and a half Joshua trees, we came to large hill and a sharp turn to the right. A green colored Chevy pickup parked on the hill in the distance. No doubts about this one. No Alamo caper here, this was a real life cammo truck! Pulling around a sharp turn to the right, we were hit with the sight of antenna mounted camera along the top of the second cammo hill to the left. Around the corner, the warning signs are not easily missed. For someone to pass these signs and trespass would be a deliberate act. You can't miss the signs or the orange posts in the desert. Our visit to the border was being monitored by the two cammo gentlemen in the truck, the cameras and possibly the wacko beam from Bald Mountain. We got out and got some photos by the signs and of the surrounding areas. We even waved hello at the Cammo-dudes and took a picture of them. One photo shows that the vehicle housed two cammo-dudes. One with a pair of binoculars and the other just sitting there. We also noticed a blade fin antenna on top of the truck. The cammo-dudes were uneventful and never bothered us. They never moved from their perch and behaved like good little Government servants. Our trip back out towards 375 on GLR took forever. I stopped and got a few rocks from the side of GLR for the family back home. We watched a few enormous dust devils tear through the desert. We decided to take mailbox road to 375, stopping along to photograph Steve Medlin's cows in the desert and the Medlin ranch off in the distance. We popped up around the corner to 375 and saw the mailbox. It was newly painted and had a signature from Switzerland on it. The famous Lockheed Skunk was even painted over. However the view from the "Black Mailbox" was spectacular looking towards the Groom range and Bald Mountain. Continuing on we reached Rachel. A quiet town out of no where that suddenly hits you in the face once passing Coyote Summit. The Inn was situated a little differently than I had imagined. I was thinking that it faces 375 but actually runs parallel with 375. The Inn was awesome. When we entered we took a place at the bar and were kindly greeted by an older gentleman. We ordered up some Alien Burgers and macaroni salad. The Macaroni Salad by the way was "out of this world" (pun intended). We then bought about 70 dollars worth of goodies from the souvenir shop, looked at all the photos and left. We did run into Pat Travis on our way out to pay for our stuff. She was a kind lady and very informative. She told us of her husband Joe's condition in the hospital and asked us to pray for him. Unfortunately, as of this writing, Joe has since passed away. We wish the best for the Travis family, Pat and the Inn. In an ironic twist, the older gentleman at the Inn told us that he was born in Columbus, Ohio, the town in which I currently reside in today. Chalk one up for the Buckeye State! That pretty much wraps up this trip report. Red Flag was totally NOT happening that day. I looked, listened and waited. Not even a crop duster flew that day! No Aurora. No MIG's. No Raptors and No Little Grey Men. Only the beauty of the Nevada desert and friendly people. A trip I will never forget!